Just when you think you know a band, suddenly Girls in Peacetime Want to Dance appears. On their 9th LP, indie soft pop heroes Belle and Sebastian burn their playbook and cut loose. If you would have told me ten years ago that Belle and Sebastian would make a high energy disco pop track about Sylvia Plath I would have laughed at you, plugged my headphones into my CD player and walked away. There is some serious reinvention happening here and while it doesn’t all work, its refreshing to see a band try some risky new ideas nearly twenty years into their career. Like many other fans, I first crossed paths with Belle and Sebastian with their sophomore LP If You’re Feeling Sinister. When I was getting into indie music in the early 2000s, If You’re Feeling Sinister had aged just enough to become considered a classic and it was love at first listen. It’s a snuggle up with a good book and a warm blanket kind of album that is warm, cozy and lovable. Even after their 2006 album The Life Pursuit came out and showed the world that his quiet little band could make noise and have some fun, I still saw Belle and Sebastian as the cozy little band instead of the fun loving pop act they were evolving into. So maybe I shouldn’t have been so surprised to hear synths and dance beats in the opening minutes of Girls in Peacetime Want to Dance but it still came as a bit of a shock. For a band that has entirely abandoned the sound that put them on the map, Belle and Sebastian sound remarkably confident in their own skin. In fact, their new identity is worn with such comfort that softer acoustic tracks “Ever Had A Little Faith” and “Today (This Army’s For Peace)” seem out of place on this album. Girls in Peacetime Want to Dance is so buoyant and energetic that when they strip away the synth stuff and drop an acoustic number on us, the transition back is uncomfortably jarring. 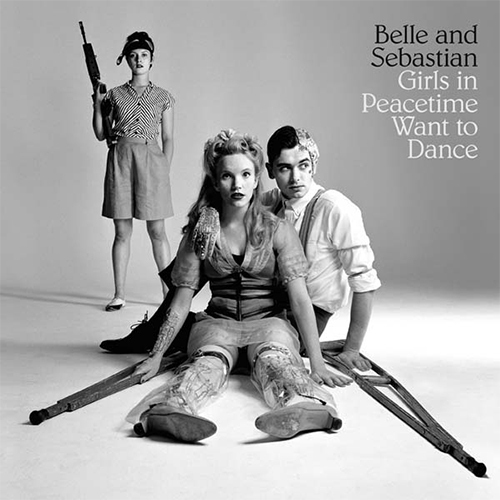 It’s great to see a band forge new identities with each release and I think overall, Girls in Peacetime Want to Dance is a win for Belle and Sebastian. “The Party Line” and “Enter Sylvia Plath” are electric and irresistible and I have tremendous respect for the band for attempting to do something way outside of their comfort zone. But there is a reason If You’re Feeling Sinister is considered indie canon. There was a delicate playfulness on that record that only shows up in isolated moments on this album. But when they manage to balance the 2015 Disco Edition of Belle and Sebastion and the 1996 Acoustic Edition of Belle and Sebastian, there is some real magic. The perfect hybrid comes late in the album with “Play For Today” which combines their classic songwriting style with their more contemporary production style. Belle and Sebastian have always had a strong sense of narrative and poetry to their music and it’s never more evident than on “Play For Today”. Reinvention is never easy but on their ninth LP, Belle and Sebastian prove that change is not only possible, it can be pretty damn fun too.